William Z. McFarland (born 1991) is an American convicted fraudster and former entrepreneur who co-founded the ill-fated Fyre Festival. He defrauded investors of $27.4 million by marketing and selling tickets to the festival and other events. In 2013, McFarland founded Magnises, a company that marketed an invitation-only charge card, using $1.5 million of investor funding. He later founded and acted as CEO of Fyre Media, which developed the Fyre mobile app for booking music talent. In late 2016, along with rapper Ja Rule, McFarland co-founded the Fyre Festival, a luxury music festival intended to promote the Fyre app. The event was scheduled to take place in April–May 2017 but was aborted after attendees arrived, due to issues with security, food, logistics, understaffing, accommodations, and talent relations. William Z. McFarland (born 1991) is an American convicted fraudster and former entrepreneur who co-founded the ill-fated Fyre Festival. He defrauded investors of $27.4 million by marketing and selling tickets to the festival and other events. In 2013, McFarland founded Magnises, a company that marketed an invitation-only charge card, using $1.5 million of investor funding. He later founded and acted as CEO of Fyre Media, which developed the Fyre mobile app for booking music talent. In late 2016, along with rapper Ja Rule, McFarland co-founded the Fyre Festival, a luxury music festival intended to promote the Fyre app. The event was scheduled to take place in April–May 2017 but was aborted after attendees arrived, due to issues with security, food, logistics, understaffing, accommodations, and talent relations. In May 2017, McFarland and Ja Rule were sued for $100 million in a class action lawsuit on behalf of Fyre Festival attendees. The following month, McFarland was arrested and charged with wire fraud in Manhattan federal court for his role in the organization of the festival. After pleading guilty to two counts of wire fraud in March 2018, he was sentenced to six years in federal prison. McFarland was raised in the Short Hills section of Millburn, New Jersey. His parents are real estate developers. At age 13, he founded an online outsourcing startup that matched clients with web designers. He briefly attended Bucknell University in Lewisburg, Pennsylvania, where he studied computer engineering for less than nine months. McFarland dropped out of college toward the end of his freshman year and founded the short-lived online ad platform Spling where he served as CEO. In August 2013, McFarland seeded payments company Magnises with $1.5 million of investor funding, aiming to create an exclusive "black card" with social perks such as club membership, targeted at status-oriented millennials in certain big cities. McFarland also launched Fyre Media Inc., the parent company of the Fyre Festival. In a term sheet sent to investors, Fyre Media claimed to be worth $90 million. By contrast, authorities allege the company did only about $60,000 in business. On July 23, 2018, The New York Post reported that would-be New York socialite Anna Delvey may have helped herself to four months of free lodging at the SoHo loft owned by McFarland, after asking to stay for only a few days. The loft was also used as the headquarters for the defunct millennial black credit card company, Magnises. McFarland with Ja Rule at the 2016 Web Summit. McFarland founded Fyre Media, and publicized a luxury music festival in the Bahamas, called Fyre Festival, to promote the Fyre music booking app. The festival, to be held in April 2017, was advertised by a video which included a bevy of Instagram models including Bella Hadid and Emily Ratajkowski who, along with Kendall Jenner, were all expected to be at the festival. However, the festival experienced a number of serious management, administration and misrepresentation issues and was canceled after guests had begun to arrive on Great Exuma island. The festival subsequently became the focus of U.S. federal investigations and multiple lawsuits. McFarland borrowed as much as $7 million in an effort to fund the festival, taking one loan with an effective annualized rate of 120 percent. The lender sued, alleging McFarland defaulted on the loan. Among those named as investors who supposedly loaned McFarland $4 million was NY socialite and entrepreneur Carola Jain. The controversy around Fyre Festival were detailed in two documentaries in 2019: Hulu released Fyre Fraud on January 14, and Fyre: The Greatest Party That Never Happened, directed by Chris Smith, was released on Netflix on January 18. On May 1, 2017, Fyre Festival organizers Billy McFarland and Ja Rule were sued for $100 million in a class action lawsuit in relation to the failed Fyre Festival that left attendees stranded on the island without basic provisions. In addition to the class action lawsuit filed in May 2017, six federal and four individual lawsuits were filed in relation to the scheme. McFarland was arrested by federal agents on June 30, 2017, and charged with wire fraud in relation to Fyre and Fyre Festival. He was released on $300,000 bail on July 1. McFarland faced up to four years and nine months under U.S. sentencing guidelines, said Assistant U.S. Attorney Kristy Greenberg. She added that McFarland's short but eventful career showed a "pattern of deception" and "overpromising luxury experiences that were not delivered". In July 2017, McFarland was represented by a public defender at a bail hearing after his previous legal team "had not been paid enough to continue to represent him". McFarland later hired the private firm Boies, Schiller & Flexner as representation. In March 2018, McFarland pleaded guilty to two counts of wire fraud in Federal Court in Manhattan and admitted to using fake documents to attract investors to put more than $26 million into his company. He agreed to forfeit over $26 million. On June 12, 2018, McFarland was charged with selling fraudulent tickets to events such as the Met Gala, Burning Man, and Coachella while out on bail. On October 11, 2018, McFarland was sentenced to six years in federal prison. He is incarcerated at FCI Otisville, in Orange County, New York. ↑ Larson, Erik (October 12, 2018). "Fyre Festival Frauster Who Targeted Status Seekers Gets 6 Years,". Bloomberg News. ↑ "Indictment and Complaint". Docket Alarm. Retrieved 4 February 2019. 1 2 Bluestone, Gabrielle (April 29, 2017). "A National Punchline". Vice. Retrieved May 1, 2017. ↑ Stone, Madeline (1970-01-01). "The organizer of the doomed Fyre festival was previously accused of scamming millennials with promises of Hamilton tickets and trips to Cuba". Businessinsider.nl. Retrieved 2017-04-28. 1 2 3 4 Lewak, Doree (July 5, 2014). "The college dropout behind NYC's most exclusive credit card". New York Post. ↑ "Fyre Festival Organizer Released on $300,000 Bail,". The New York Times. July 1, 2017. ↑ “Black card for millennials,” Fox Business, July 11, 2014. 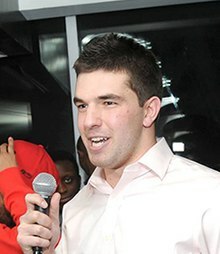 ↑ Christopher Wink, “Spling founder Billy McFarland: our investors are in New York City,” Technical.ly / Philly, March 6, 2012. ↑ Madeline Stone, "A 23-year-old created a club for elite millennials where everyone gets a black card and parties in a New York City penthouse," Business Insider, July 17, 2015. ↑ "Magnises". Crunchbase. Retrieved 26 January 2019. ↑ Griffith, Carson (March 18, 2014). "Musicians Embrace Magnises, a Black Card for the Younger Set,". Billboard. ↑ Earle-Levine, Julie (April 20, 2014). "Techie creates starter 'black card' for 20-somethings". New York Post. ↑ Glass, Jeremy (April 18, 2014). "Magnises: The Only Other Black Card You Need to Know About". Supercompressor.com. ↑ "The Mastermind Behind NYC's Newest Black Card". Bloomberg TV. August 19, 2014. ↑ "Fyre Festival $100 Million Lawsuit Targets Investors Behind the Scenes". Bloomberg News. 2017-05-09. Retrieved 2017-08-07. ↑ "Fyre Festival Founder McFarland Released on Bail to Return Home". Bloomberg News. 2017-07-01. Retrieved 2017-08-07. ↑ Ryan, Lisa (2018-07-23). "Anna Delvey May Have Scammed the Fyre Festival Founder". The Cut. New York. Retrieved 2018-07-24. ↑ Siegler, Mara (2018-07-23). "Wannabe socialite swindler may have bilked Fyre Festival fraudster". New York Post. Retrieved 2018-07-24. ↑ Joe Coscarelli, "Fyre Festival, a Luxury Music Weekend, Crumbles in the Bahamas," New York Times, April 28, 2017. ↑ Joe Coscarelli, Melena Ryzik and Ben Sisario (21 May 2017). "In Wreckage of the Fyre Festival, Fury, Lawsuits and an Inquiry". The New York Times. Retrieved May 22, 2017. ↑ "Fyre Festival Was Buried Under Millions in Debt Before It Even Began". Bloomberg.com. 2017-05-15. Retrieved 2017-08-07. ↑ "How Carola Jain, a Well-Connected New York Investor, Got Duped Into Funding the Fyre Festival" Town & CountryJAN 26, 2019. ↑ McLevy, Alex. "Who has the better Fyre Festival documentary, Netflix or Hulu?". TV Club. Retrieved 2019-01-28. ↑ Parisi, Paula (May 1, 2017). "Mark Geragos Files $100 Million Suit Against Fyre Festival". Variety. Retrieved 2019-01-28. ↑ Parisi, Paula (May 26, 2017). "Fyre Festival Lawsuits Advance on Dual Civil, Criminal Tracks". Variety. Retrieved 29 July 2017. 1 2 Ben Sisario (July 1, 2017). "Fyre Festival Organizer Released on $300,000 Bail". New York Times. Retrieved July 25, 2018. ↑ Anna Gaca (October 3, 2017). "Fyre Festival's Billy McFarland Pleads Not Guilty to Wire Fraud". Spin. Retrieved July 25, 2018. ↑ "Fyre Festival: Billy McFarland admits fraud over 'luxury' event". BBC News. March 7, 2018. ↑ Wang, Christine (2018-03-06). "Billy McFarland, organizer of disastrous Fyre Festival, pleads guilty to misleading investors". CNBC. Retrieved 2018-03-06. ↑ Stevens, Matt (June 12, 2018). "Fyre Festival Organizer Sold Fake Tickets While Out on Bail, U.S. Says". The New York Times. Retrieved June 13, 2018. ↑ "William McFarland Sentenced to 6 Years in Prison in Manhattan Federal Court for Engaging in Multiple Fraudulent Schemes and Making False Statements to a Federal Law Enforcement Agent" (Press release). Department of Justice, U.S. Attorney's Office, Southern District of New York. October 11, 2018. Archived from the original on October 19, 2018. Retrieved January 22, 2019.